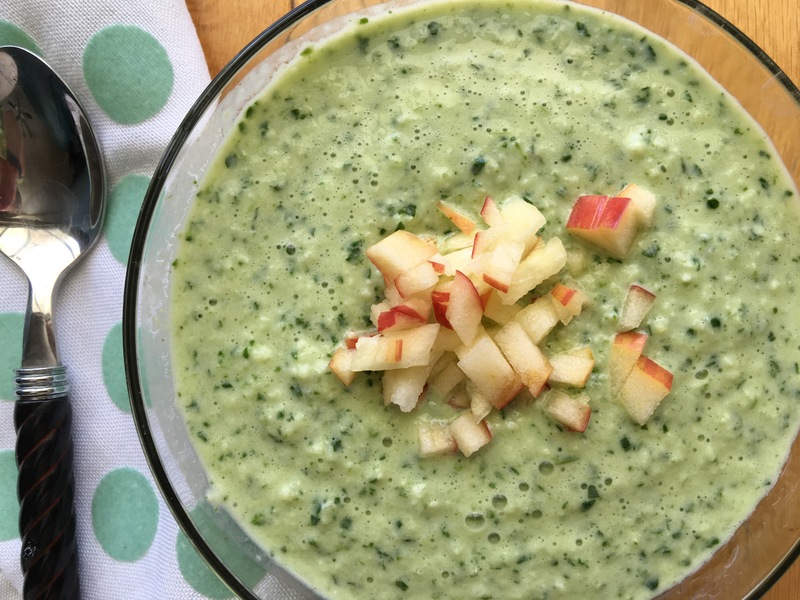 My Green Smoothie Breakfast Bowl is one of my new favorites to start the day. Why? First because it tastes so good and is refreshing. Second, because it is healthy and filled with protein and lots of good vitamins. Third, because it is so easy to make and makes 2 servings, so if you are making it for yourself then you have 2 days worth of wholesome goodness. It keeps very well in the refrigerator. If you have children in the family, you might find that they love to eat this for breakfast. What a great way to have a healthy breakfast and get the children out the door for school knowing they just eat a lot of vitamins. 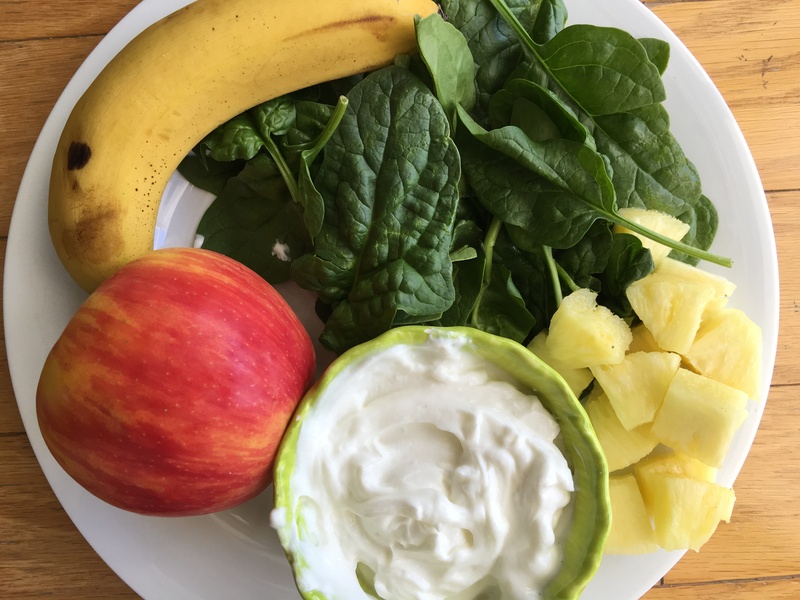 Above you see the ingredients for making the Green Smoothie Breakfast Bowl, one sweet apple, 1 banana, 1 cup of pineapple, a large handful of spinach and 1 cup of Greek 0-fat yogurt and a food processor. It couldn’t be easier to make and very fast. It takes no more than 10 minutes to make. I found that I ate 1/2 for breakfast and was going to save the other half for the next day but later that night I ate it. That isn’t a problem because it is so easy to make you can make another one in a jiffy! Which I did the next morning! Green Smoothie Breakfast Bowl with Fresh Fruit and Spinach is filled with vitamins and is a great way to start your day. Peel the apple and cut into small chucks. Save some of the red peel and dice for garnish for the top. Cut up the banana, pineapple. Place all ingredients into a food processor and process until the it is the consistancy that you want. Pour into 2 bowls and garnish with the apple. I'll have to check out your smoothie board. I do love the texture of this one. That is so healthy that you could have it for breakfast and then again for dessert. Sweet! And I did! It would be a healthy dessert for sure! Looks so nutritious. I will admit I am not a big fan of the smoothie bowl, add some extra liquid and a straw and it is easy to drink as you commute. Saying that, your recipe just may convert this big kid. I especially love the diced apple on top. Now, you can't do that if you are drinking it through a straw!!! I've never really gotten into smoothies either because I think they are milkshakes and then I want a hamburger. lol... But with this one the texture tends to make you feel like you are eating a real meal. I think I'd use my blender for this to get it extra smooth. Lots of healthy foods to start the day, though! Yes, you could do it in a blender and make it into a smooth smoothie. I really liked the chunky texture. So easy and so healthy too! Perfection! Thanks Tina! It is a good one!